Get a Free Breakfast Melt & 18 oz cup of coffee. Free the week of Jan. 28th, 2013-Feb.2nd, 2013. 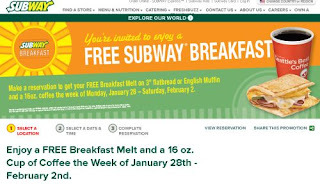 Make your reservation for your free Subway breakfast. Click the link below to go to the Subway website and find your nearest location to get your free breakfast reserved.